The weighted version not only helps sink or "swim" a rigged bait down into the strike zone, but helps to increase casting distance. 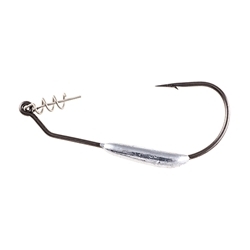 The weight is positioned low on the shank to provide a keel" effect so that baits rigged weedless-style will swim naturally (as opposed to rolling or flipping when weights are inserted inside soft baits). The weighted version is ideal for Swimming Senkos, swimbaits, flukes and other small profile plastics. With Owner's unique "Centering-Pin Spring" (CPS - patent pending) attached to the hook eye, baits can be "permanently" secured by inserting the pin in the center of the nose of a soft plastic, which can then be screwed onto the TwistLOCK coil spring so that any bait will rig perfectly everytime! The "Open" gap allows for more positive hook sets. Features include a 30° eye-bend, an X-strong forged shank, Super Needle Point, and black Chrome finish.